Capsule and appearance may vary from image. Mechanism of Action: Porcine thyroid extract contains cleaned, dried, and powdered triiodothyronine (T3, liothyronine) and tetraiodothyronine (T4, thyroxine). These molecules are structurally identical to the thyroid hormones that are naturally made by humans. They act by both inducing natural effects of thyroid hormones while simultaneously, just like in a regular functioning body, suppress their own secretion by downregulating secretion of thyroid stimulating hormone. Indications: Exogenous thyroid hormone is indicated for replacement hormone therapy in patients who have hypothyroidism, to suppress thyroid-stimulating hormone secretion in the pituitary gland, and as a diagnostic tool to distinguish thyroid-related pathologies. Drug Interactions: Oral anticoagulants such as warfarin will be affected by exogenous oral thyroid hormone. Patients taking warfarin who are found to need thyroid hormone should be watched closely. The dose of warfarin will most likely have to be reduced due to thyroid hormone’s ability to increase catabolism of vitamin-K dependent clotting factors. Thyroid hormone may increase insulin production and change hypoglycemic requirements. If you are diabetic, you may have to eat more carbohydrates to correct for hypoglycemia. Separate porcine thyroid with cholestyramine administration by at least four hours as cholestyramine binds to thyroid hormone thereby reducing its absorption in the gut. Estrogen containing oral contraceptives (birth control) may increase thyroid requirements in patients without a functioning thyroid gland. Ask your doctor if your birth control contains estrogen. Not all birth control methods contain estrogen. Adverse Effects: Adverse effects are rare for this drug as it mimics compounds naturally found in the body. If you see signs of overdosage such as increased sweating, heat intolerance, increased bowel movements, anxiety, nervousness, tremor, heart palpitations, fatigue, or weight loss this may be a sign of a serious life-threatening condition called thyrotoxicosis. This is a medical emergency and patients should seek emergency medical care. 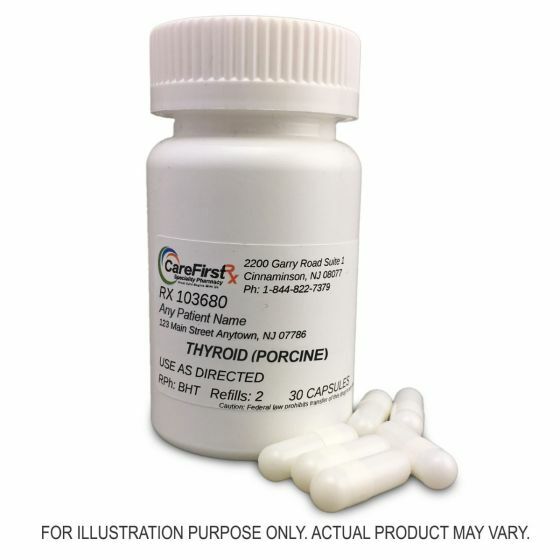 Administration/Dosing: Porcine thyroid hormone comes as an oral formulation and should be taken exactly how your doctor prescribes it. Treatment is individualized, and your doctor will order blood tests to see whether or not to change your dosage. Thyroid supplements are normally taken in the morning on an empty stomach with a full glass of water. Pregnancy – Tell your doctor if you are pregnant. Thyroid hormones are considered to be safe in pregnant women. Breastfeeding – Thyroid hormone is not associated with serious adverse effects in newborns who are breastfeeding. Children/Pediatrics – Use in pediatric populations is normal and considered safe upon diagnosis of hypothyroidism. Thyroid. Lexi-Drugs. Lexicomp. Wolters Kluwer Health, Inc. Riverwoods, IL. Available at: http://online.lexi.com. Accessed July 24, 2018. “Hypothyroidism.” 2012 : 142–145. Print.